The Teen Citizens Police Academy is an educational and informative program modeled after the Pearland Citizens Police Academy. 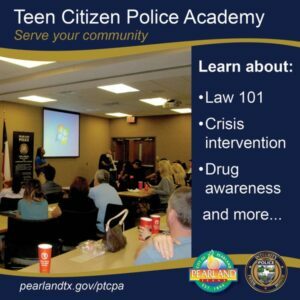 The teen academy is designed to give young people the opportunity to learn about the Pearland Police Department and its operations in an effort to demonstrate the benefits of law enforcement and community policing in our city. The academy also gives the department an opportunity to interact with teens within the community and solicit their feedback and ideas through discussion of relevant issues. Through this 8-week academy course students will acquire knowledge and understanding of the functions and responsibilities of individuals providing law enforcement services in Pearland. Meetings are held on Monday nights from 6 to 8 p.m. at the Pearland Police Department, 2555 Cullen Parkway, Pearland 77581. (Parents/Guardians are asked to attend the first class night if possible). Please contact Officer Z. Davis for more information or visit the City’s TCPA page.